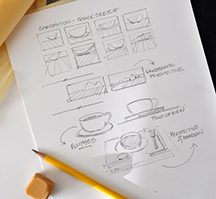 This simple one-day workshop on drawing will walk you through many of the “basics” of drawing. Whether a refresher or the first drawing class you have ever taken, it will make sense and help you have a better understanding of drawing. Developed by the many requests of painting students, Douglas has assembled all the basic areas of drawing and the things he thinks you need to know to make your paintings better and to correct problem areas that might come up in your work. Some of the basics of composition and general sketching to get shapes and proportions correct, massing in large shapes, simple easy to understand perspective for landscape/seascape, understanding and tackling the task of drawing the various ellipses on vases, pitchers, bowls and plates for floral/still lifes, point-of-view, contour line, figure and how to build into a streetscape and get the scale correct, and the checklist of what to look for when trouble shooting a painting and a drawing problem.